Well, Christmas came too soon! And ended too soon as well. It was no doubt a difficult time for my family and I. It was the first one without my mom, and like they always say, the first holidays are always the hardest. Mother's Day, my birthday, Thanksgiving, Christmas, New Year's..I imagine these holidays will always be tough because I've never spent a single one without her. But...I don't believe in being a Grinch and regardless of my personal struggles, I believe Christmas should always be a time to celebrate whatever joys you have. And my biggest joy: my family. We did the usual dinner at our house. My uncle (mom's brother), his wife and my little cousin came over. We always celebrate holidays and birthdays together. My uncle brought the meat to BBQ, auntie brought Miki (a Filipino version of Chicken Noodle Soup), and as always, I made the desserts! Well, some of it least. As much as I wish I did, I did not make that Chocolate Haupia Cake you see here. I baked cookies and Peppermint cupcakes (not seen here, they were in the fridge, womp womp). That big piece of meat there, the star of the show, we'll get to that in a little bit. 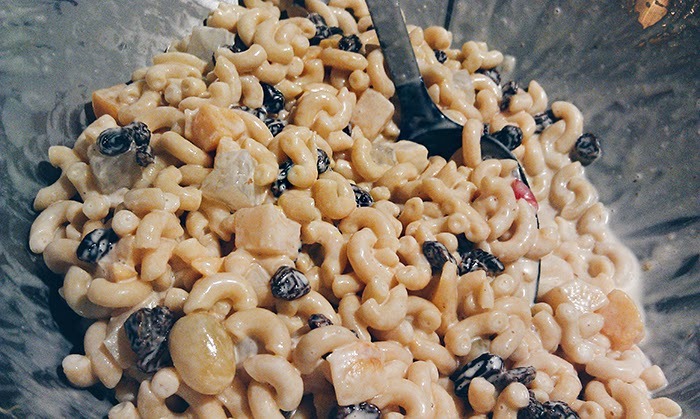 I also made my mom's Macaroni Fruit Salad. It's one of my favorite dishes she used to make. I first attempted it for Mother's Day last year and I was determined to make it taste like hers. I'm not exactly sure of all the ingredients she used, but I'm sure I came pretty close. I'll never forget when my dad tasted it the first time I made it and he said, "it tastes like your mom's." That warmed my heart so much. I hope I made you proud, mom. I know I'll never be able to cook like you, but I hope I can carry on some of your recipes, or at least attempt to try. What I love most about this dish is you can alter the amount of ingredients to your liking. If you want more fruit, add more fruit. If you don't want it too sweet, add less sugar, and so on. Below is the approximate measurements that I used (I tend to eyeball a lot of stuff when I cook) for 2 boxes of macaroni (that feeds A LOT of people), but you can always half the ingredients for just 1 box. Easy peasy! Directions: Cook macaroni according to instructions on the package and drain completely. Drain the fruit cocktail and coconut gelatin. Combine all the ingredients except the sugar. Start w/ 1 cup of sugar, mix thoroughly and adjust to taste. Once everything is mixed, it will look like it has a liquidy sauce because of the warm macaroni (like the photo below), but once you cool it in the fridge for an hour or so, final result will be creamy! 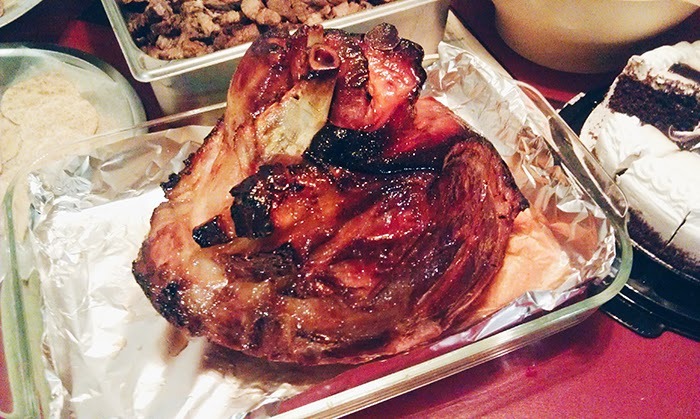 And next on the agenda, drum roll please...the Holiday Ham! Ok, first off let me just say I have little to no experience cooking meat. I Googled sooooo many articles on how to cook this thing and after it was done...my family loved it! I used a Pineapple Ginger glaze. I personally don't eat a lot of meat, especially sweet meat, so I skipped the ham. 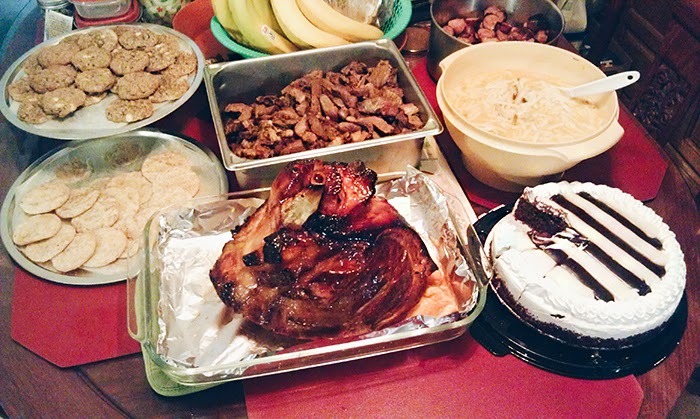 Fast forward to New Year's eve, which I have no photos of, and the menu was pretty much the same. I made another ham since everyone enjoyed the last one but used a Honey Mustard glaze instead. We popped some lame poppers after dinner (Hawaiʻi has a partial ban, and maybe soon to be complete ban, on fireworks), and then watched the sky light up with illegal Aerials once it hit midnight (so much for a fireworks ban!). It wasn't the most happiest Christmas and New Year's Eve for my family, but I know as the years go by...happiness will find its way back in again.